The Kid Who Would Be King is a 2019 Action Adventure Fantasy Family movie directed by . It stars Louis Ashbourne Serkis, Denise Gough, Nathan Stewart-Jarrett, among others. 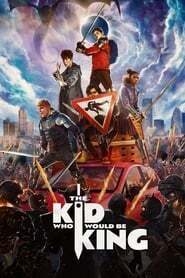 The Kid Who Would Be King is currently rated 6.1 stars on the ReelBugs scale. Strange women lying in bathtubs distributing swords is no basis for a system of government. Supreme executive power derives from a mandate from the masses, not from some farcical aquatic ceremony. Knife crime in London are rife in schools. So kids are now moving to swords. Patrick Stewart as Merlin wearing a Led Zeppelin shirt? I'm in! Trailer needed: From The Director of Attack the Block. Premise started out kind a "meh", then got interesting with the performances and change of pace. This looks like a lot of fun. Attack the Block took a pretty basic premise and turned it into a great film and I kind of think this could do the same. I love a good old generic establishing shot of London. Never seen that before. Attack the block was awesome, looking forward to it!! Move over, Guy Ritchie. This is the version we need. Looks like a great film with an original concept. The Americans will hate it because they didn't think of it first and it's not set in Camelot High, Pasadena. I was really surprised by how much I enjoyed this movie. I’ll be there opening night!!! !